Homemade Christmas gifts are infinitely cheaper than the ones you buy from the store. And besides, these holiday DIY crafts are easy to do and the materials are readily available in your house. You and the kids will enjoy putting your heads and hands together making them. Or invite your girl friends over for an afternoon of craft making while sipping wine. As another plus, you’ll get to save more money that you can use to buy gifts or to spend for yourself. From a wreath to hang on your door to welcome the guests to a centerpiece on your dining table when you share your Christmas meal, these DIY Christmas decors are perfectly designed to spread the holiday cheer. Put together a wreath of bows. Design Improvised offers a brilliant project that will only use up half an hour and $15 to make. 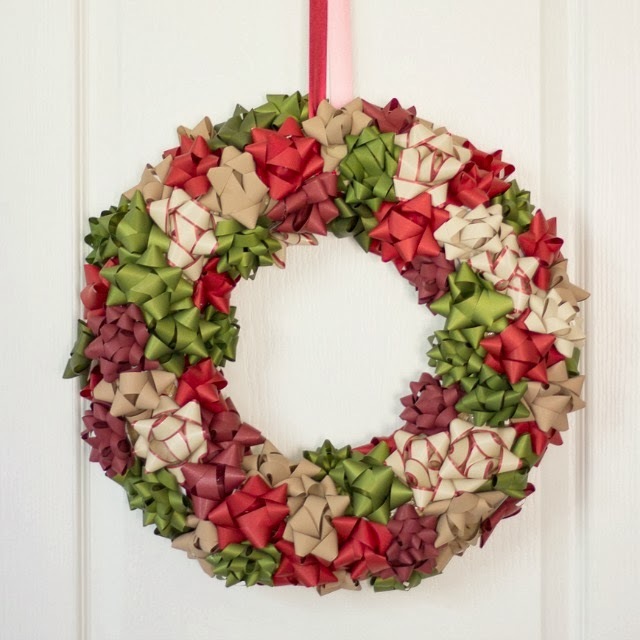 With a glue gun, stick lots of bows in different colors and sizes onto a 14” straw wreath (or Styrofoam wreath). Make sure to cover the whole wreath including the sides. That’s it and it’s ready to hang on your door! 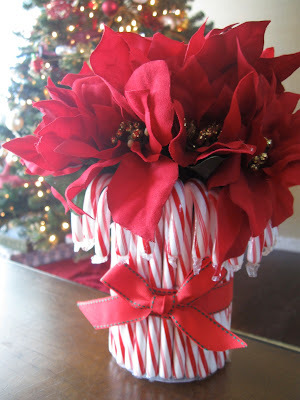 Arrange flowers in a candy cane vase. How about a unique floral centerpiece that everyone will definitely notice? A vase made of candy canes! It’s easy on the wallet and uses recycled materials. All you need is a glue gun, an empty can, and candy canes. Living Well, Spending Less shows how affordable and creative Christmas decors can be, especially for the penny pinchers out there! Dress up old wine bottles. Don’t throw away those bottles yet because you can still upcycle them as Christmas decors. You can be imaginative with the characters and “outfits” to dress up your bottles. Or try the ones on the photo: Frosty the Snowman, Santa Claus, and Rudolph. Build a wine cork Christmas tree. While we’re on the subject of wine, there’s another use for those corks – a DIY Christmas tree. Glue them together to form a triangle and you can add embellishments for extra effect! Place it anywhere in the house and your guests won’t stop gushing about it. Besides cork flooring, there’s another use for those corks after all!